One of South Africa’s annual literary highlights is the Open Book Festival. This usually takes place in and around Cape Town during early September, which is the start of spring. They’ve had great guests before, including some amazing international and local authors I would heartily recommend. 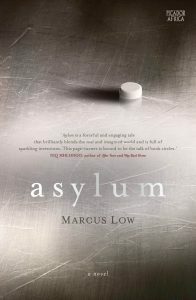 In the early 1960s, South African public health authorities developed an extensive program of involuntary quarantine that removed those with MDR-TB from their homes and incarcerated them in facilities that are often much as described in Low’s book. At its peak, the Ministry of Health detained 1,700 people in substandard facilities, said to be similar to prisons, sometimes without treatment. I heartily recommend the book. I expected to like it, but when I finished it I was surprised by how much. You can buy the electronic version on Kindle. Or, if you can, pay a visit to the Book Lounge or another independent bookshop and pick up a copy. For bonus points, you can read some of Marcus’s technical work on the subject of tuberculosis treatment in the 2017 Pipeline Report.